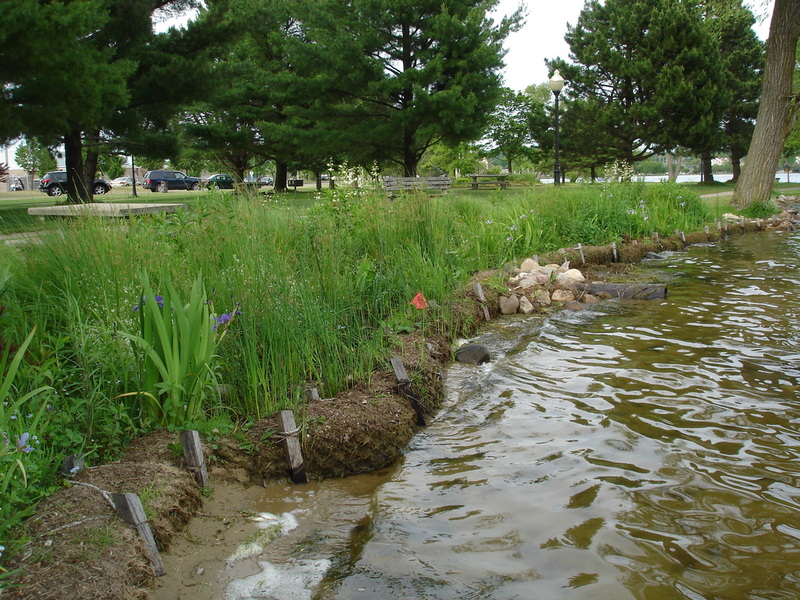 In 2011 Carolyn completed the Michigan Natural Shoreline Professional Training and Certification Program. 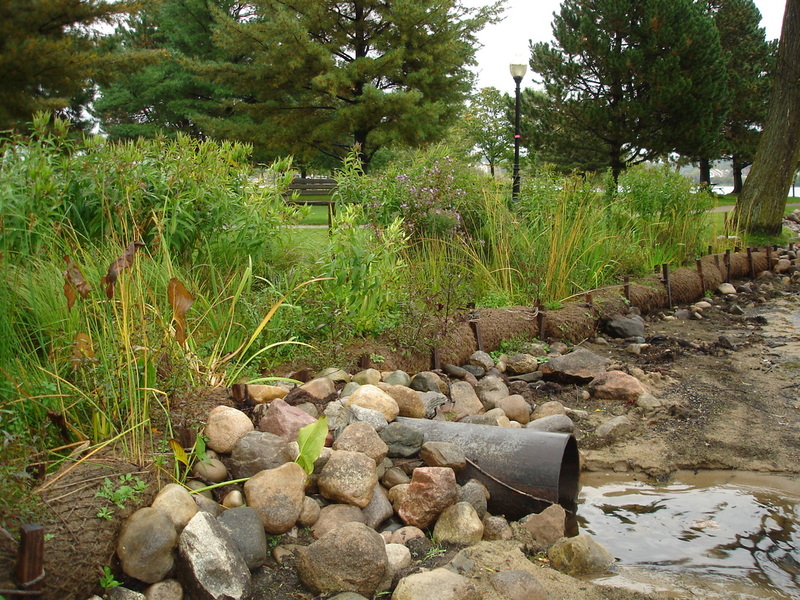 This certification was created and offered through a partnership with the Michigan State University Extension, Michigan Nursery and Landscape Association, Department of Natural Resources, and additional partners. 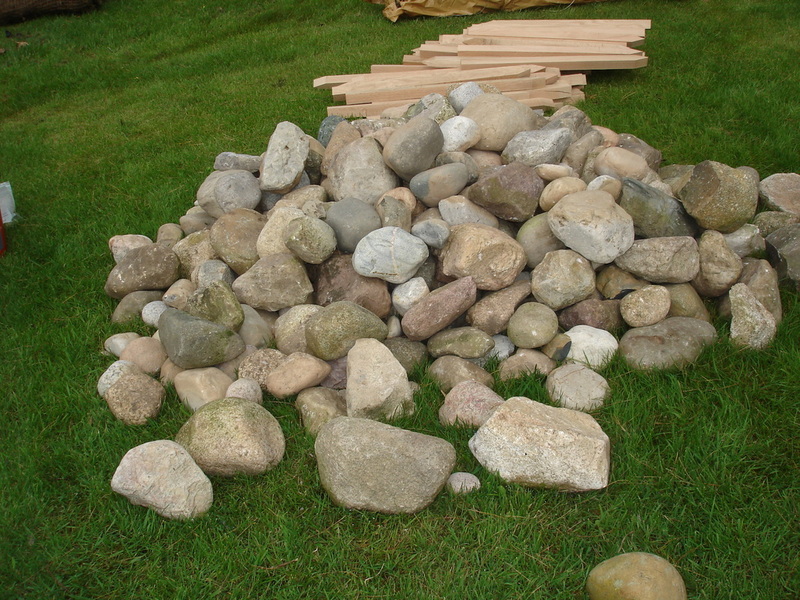 Information about this certification program can be found at https://sites.google.com/site/mishorelinepartnership/. 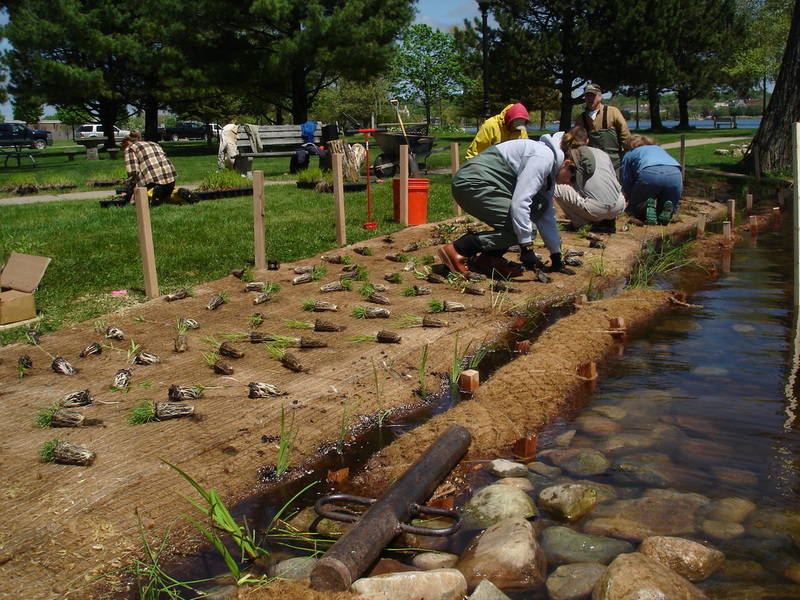 The certification consisted of three days of classroom instruction in March, 2011 and one day of field training in May, 2011. 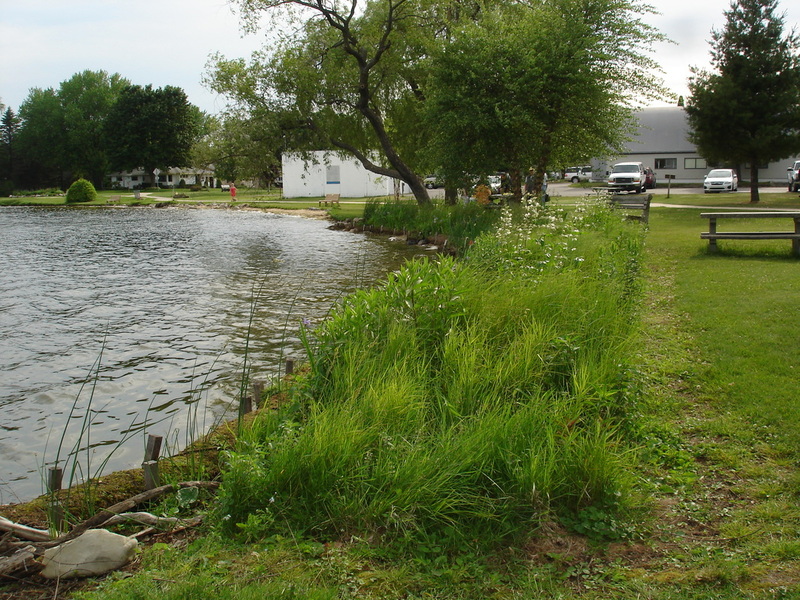 Carolyn's training was in Cadillac and the field day was at the Naval Reserve/Community Building public park on the west side of Lake Cadillac at, 601 Chestnut Street, Cadillac, Michigan. 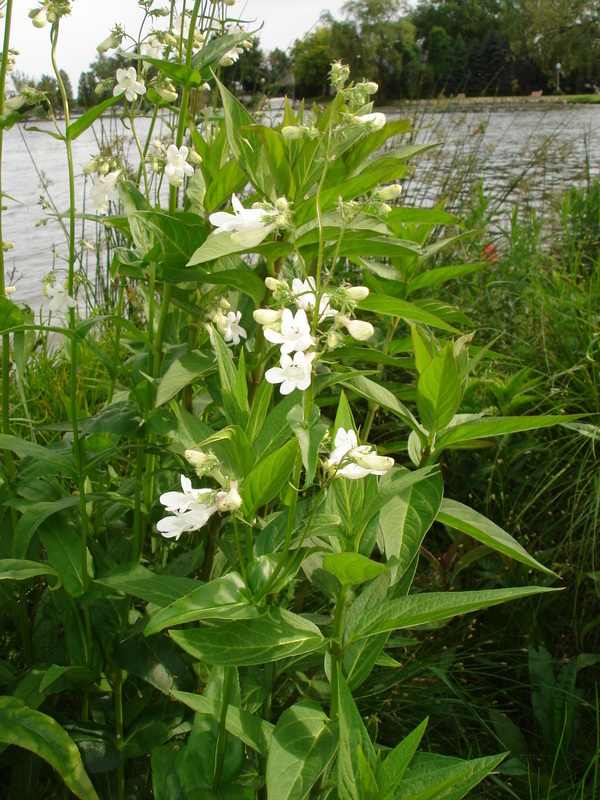 See site location on Mapquest http://mapq.st/Yyhb7p. 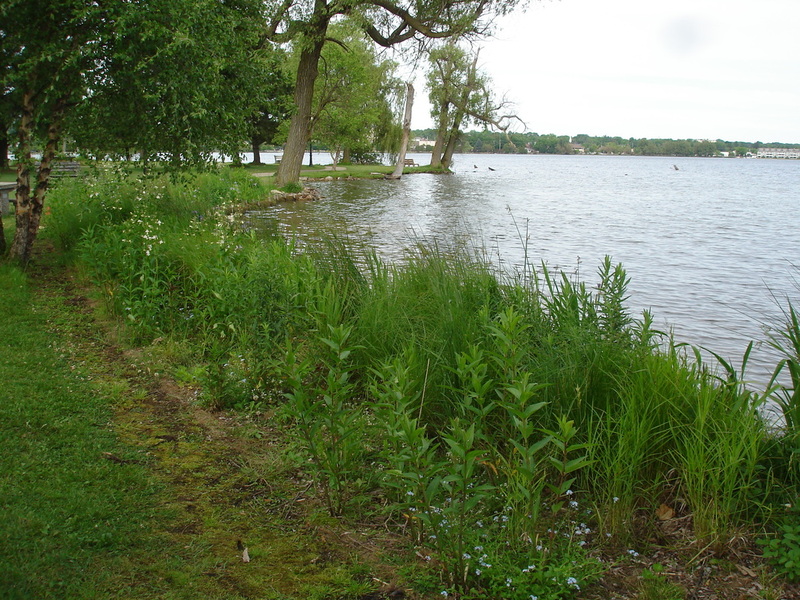 The site had mowed lawn to the water's edge, seasonal fluctuating water level, less than 1' high slope to the water's edge, foot traffic to the water's edge, an existing storm drain into the lake, and minimum wave action. 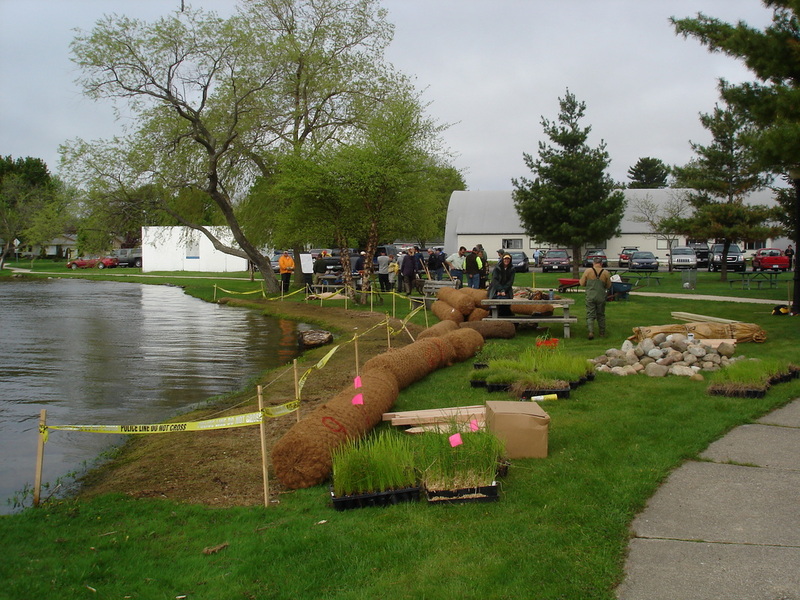 The goal was to stabilize the shoreline with coir fiber biologs, rock riprap in spots, soil erosion blanket, root carpet mat, and the planting of Michigan native plants. 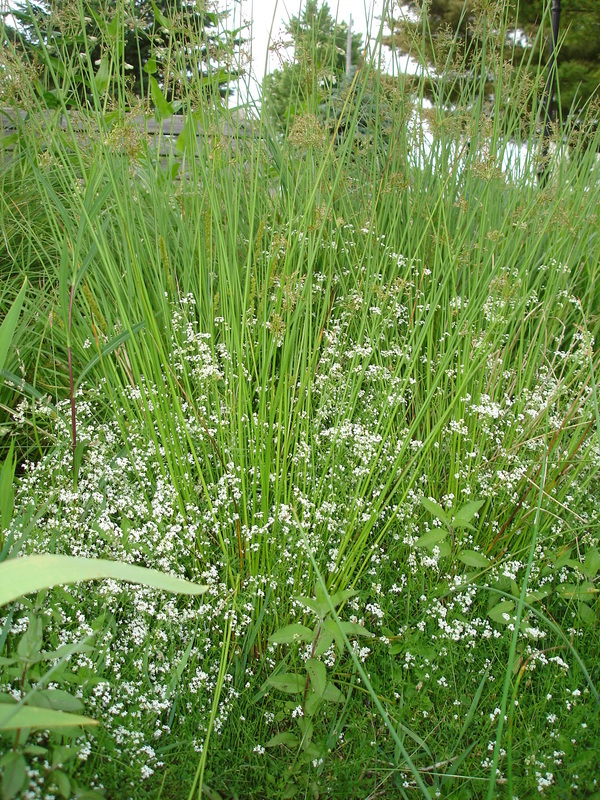 The lawn was chemically treated with aquatic approved glyphosate-based herbicide. 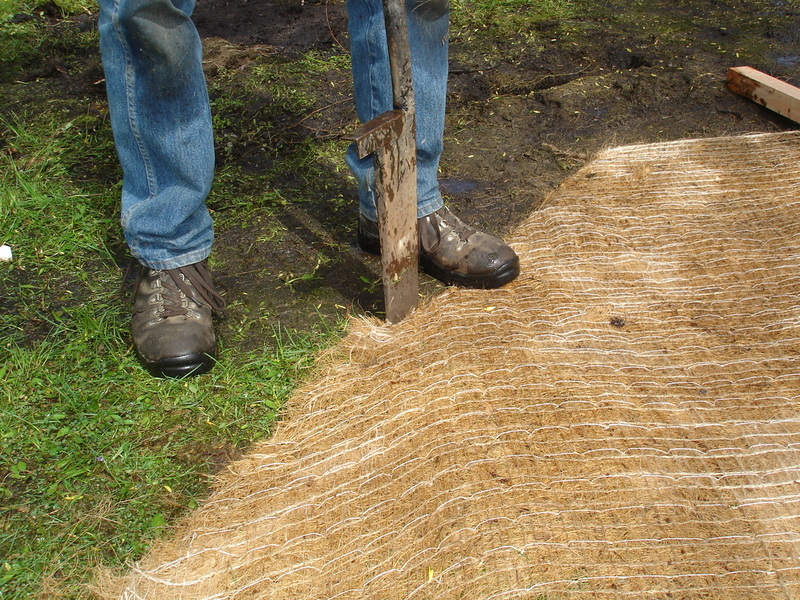 This approach kills the lawn and retains the existing root mass preventing soil erosion. 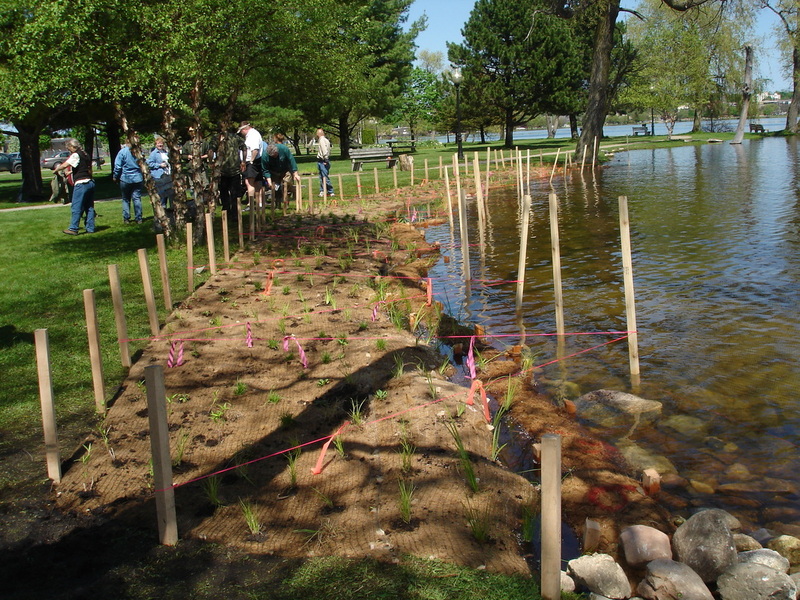 Erosion control blanket was then placed along the shoreline with a 1/4 in the water and 3/4 on shore. 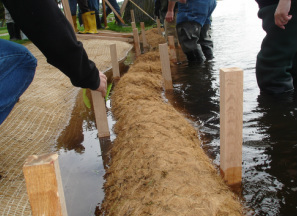 Coir fiber biologs were placed on the 1/4 of erosion control blanket in the water and secured in place with wooden stakes and twine. 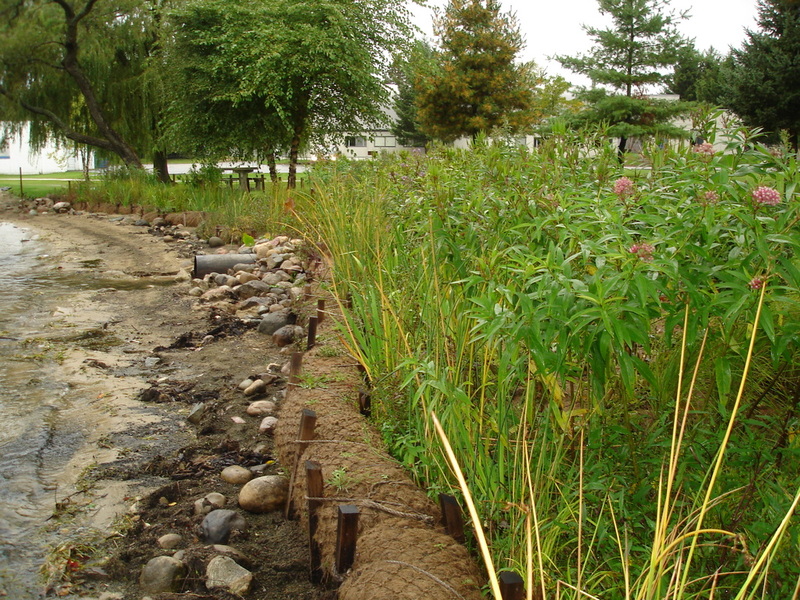 Rock riprap were placed around the existing storm drain and at each end of the coir fiber biologs row. 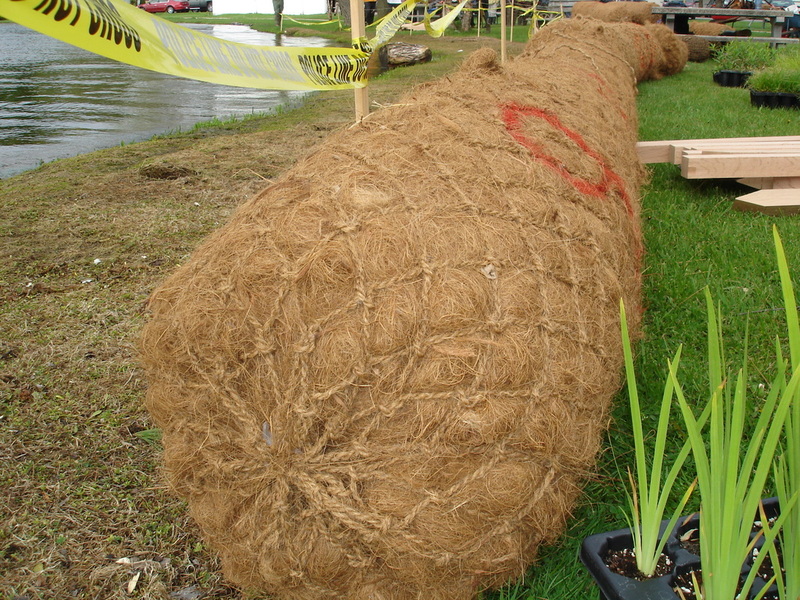 As an experiment a root carpet mat was submerged with coir fiber biologs wrapping around it. 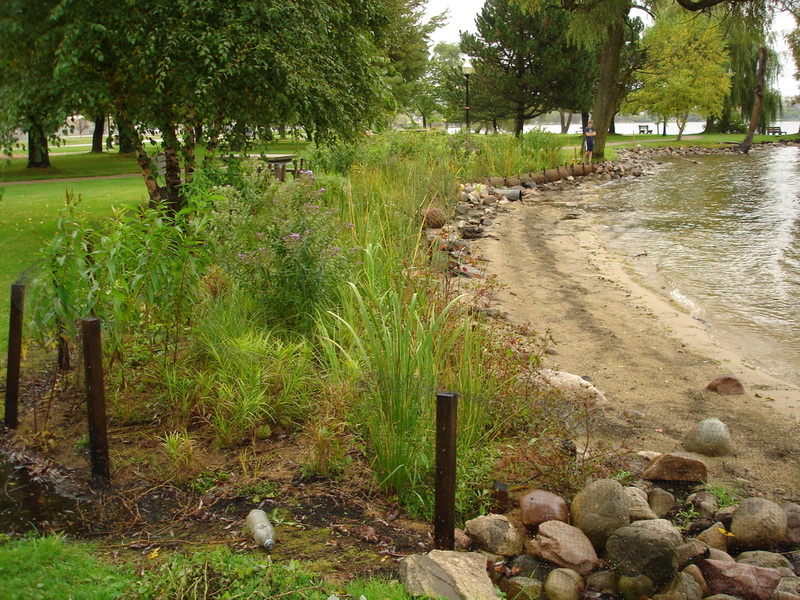 Michigan native plants were planted on the biologs and along the shoreline. 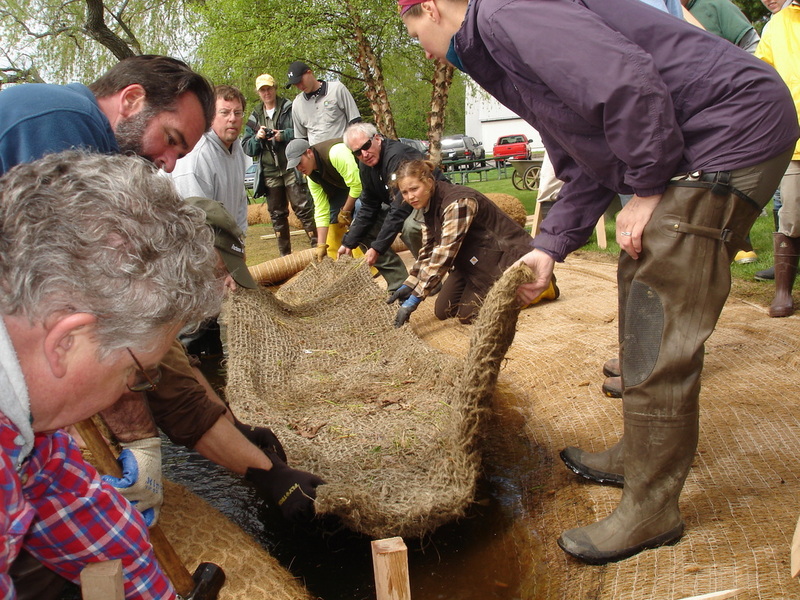 To protect the site the first growing season wildlife netting was installed all around the planting. 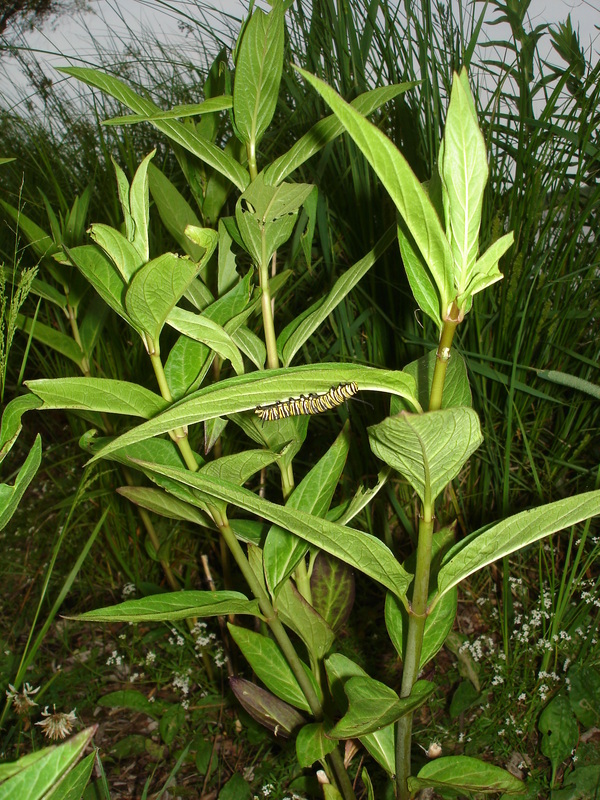 Additional string was zig-zaged across the planting to deter wildlife from landing within the planting. 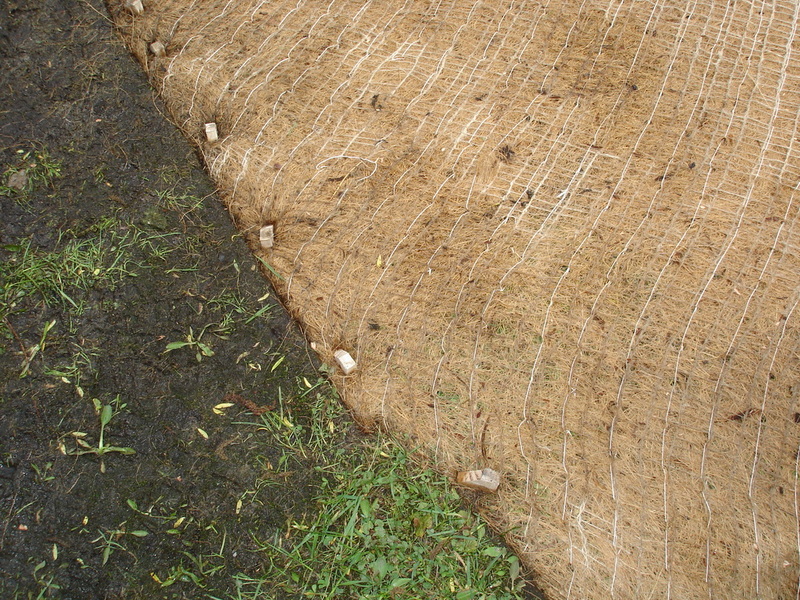 Spading the edge of the erosion control blanket into the ground. 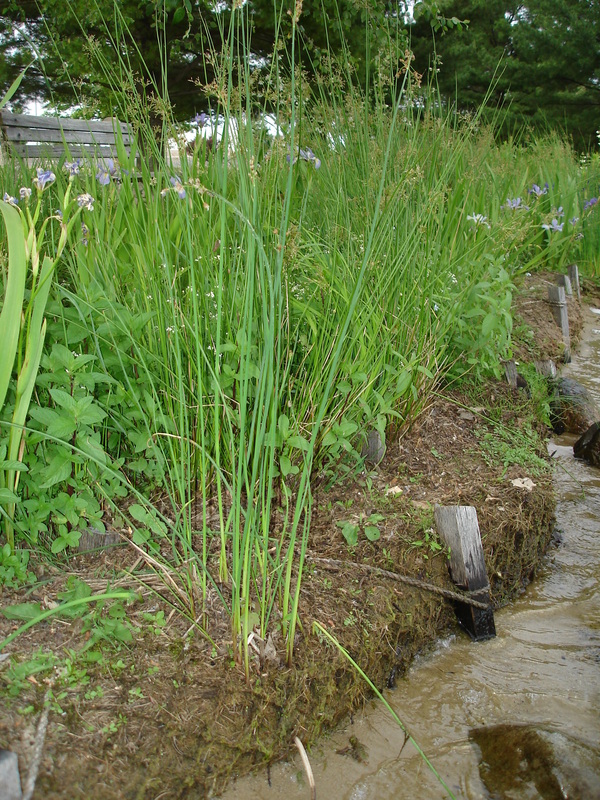 Staking the biologs with wooden stakes. 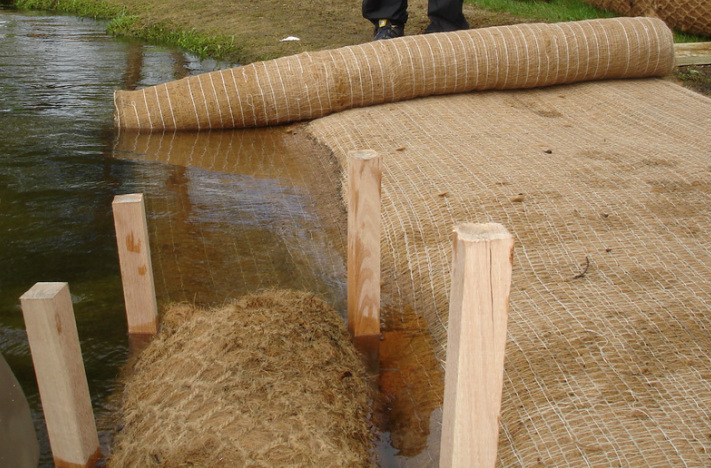 Adjusting the soil erosion control blanket. 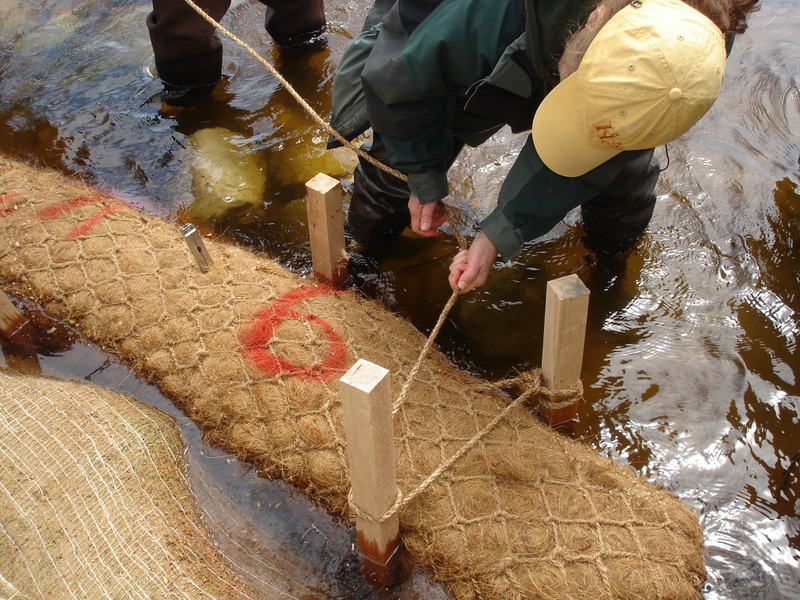 Positioning rock riprap at the ends of the biologs. 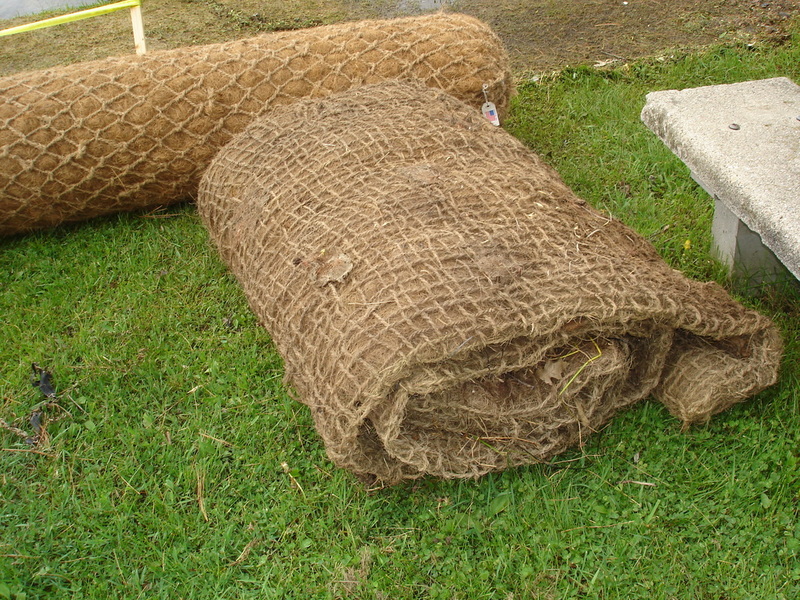 Sinking of the root carpet mat. 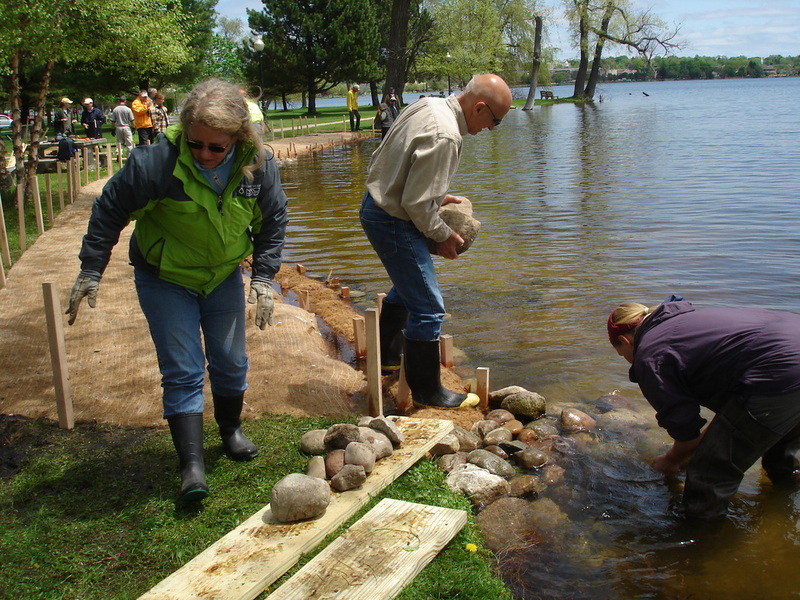 Lake Cadillac water level changes throughout the year. 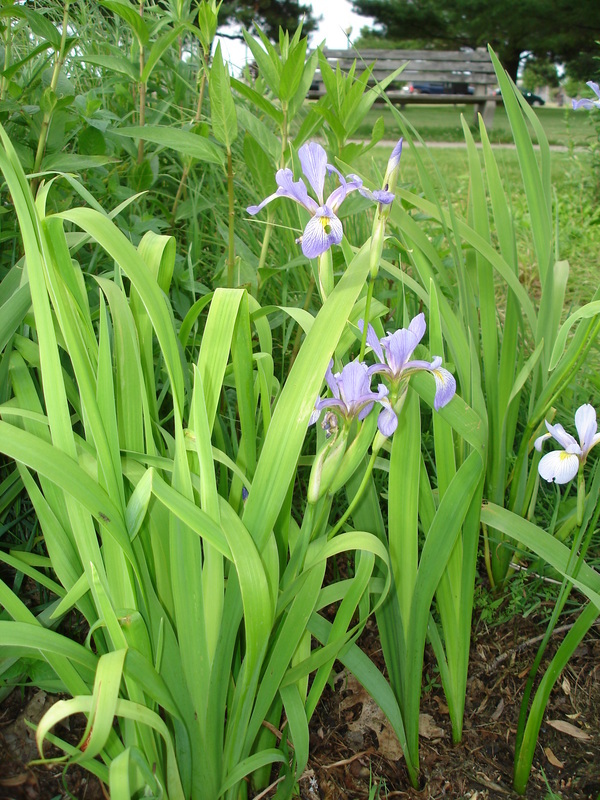 In the fall the water drops to its lowest level.